Last month a friend and I caught up over some slices of pizza and an order of breadsticks for lunch at Vito's on La Cienega. The pizza we had was mediocre. Perhaps only ordering a whole pie fresh is the way to go? In any case the saving grace of the meal was the order of breadsticks. They were garlicy and had oil and parmesan on them. The texture had a nice chew, not flimsy but not too heavy. These were great. 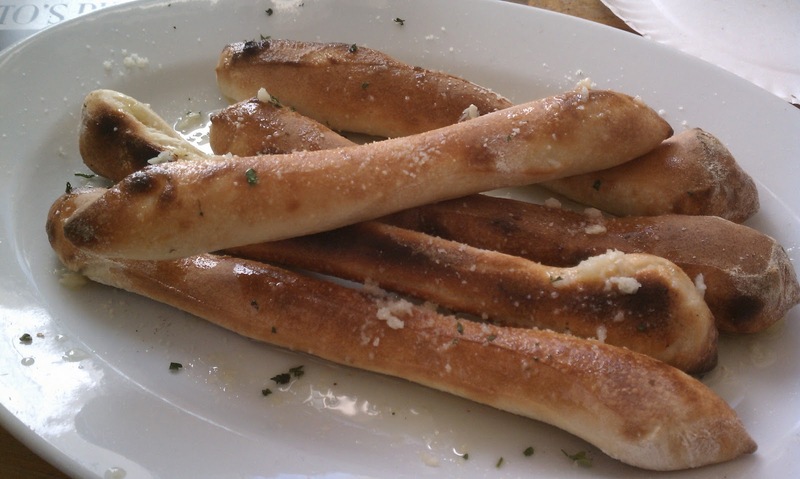 The waitress warned us that there would be a wait for the breadsticks, and I am glad that we waited as they were the highlight of the meal. They arrived after our pizza and were very much worth the wait. At this point I'd go back to get the breadsticks and skip the pizza. Ordering a whole fresh pie is always the way to go. Slices degrade during the reheating process. Yummy, Colorful Bread sticks and nice posting . thanks for best details posting in recently post.